This 4 Day rwanda safaris offers the best of Rwanda gorilla tours to Virunga national park and later visit Karisoke research center founded by Dian Fossey , find out more about the mountain gorillas. 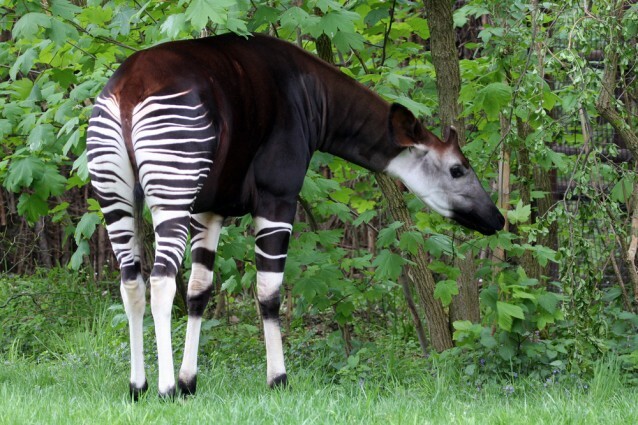 okapi at virunga national park. The Karisoke Research Center in the Volcanoes National park was founded in 1967 by Dian Fossey, to study endangered Mountain Gorillas. Fossey chose a location between Mount Karisimbi and Mount Bisoke; the name is a combination of these two mountains. Today there are almost 500 Mountain Gorillas inhabited in the Virunga mountains, a significant increase since the Center was established. The Karisoke Research Center. The Center is the best hope for the survival of the endangered Mountain Gorillas and their ecologically critical habitat. Today, the Karisoke Research Center conducts extensive daily protection and monitoring of the Mountain Gorillas; numerous science and research projects, various education initiatives and community health and development projects. Since Karisoke was established, they have produced unparalleled amounts of information about the Mountain Gorillas and their habitat; attracting scientists and science students from around the world. The center currently employs more than 100 staff members, the majority being Rwandan. Dian Fossey is buried on the grounds of the Center, next to the grave of her favorite Gorilla, digit. You will be met at Kigali International Airport by your Jewel Safaris guide, who will give you a brief tour of Kigali City before begining your drive to the Virunga National Park. The main focus of the tour will be to visit the Genocide Memorial Center at Gisozi. Lunch in Kigali at a local restaurant; an opportunity to taste some Rwandese cooking. There is also an opportunity to explore one of the local markets in and around Kigali, if you are interested in looking at some of the local handicrafts and artwork for sale. After lunch you will proceed to the Virunga National Park and check in at your accommodation. The drive from Kigali to the Park Gate is 2 hours. Your guide will tell you of optional stops along the way; markets, handicraft workshops and community centers. You can discuss with your guide if any or all of these would be of interest for you to explore. DAY 2: GORILLA TRACKING – VIRUNGA NATIONAL PARK. After breakfast you will be taken to the Virunga National Park headquarters where you will meet your Ranger-Guide who will lead you on the Gorilla Tracking Tour. It could take anywhere from a few minutes to a couple of hours to spot the Gorillas, depending on where they are on that day. After trekking, if time permits, you will be taken to Ruthengeri for lunch and a tour of the beautiful lakes in the region, Lake Ruhondo and Lake Bulera.. In the late afternoon, you will be taken to your accommodation for a rest; alternately, your guide is available to take you to visit one of the local communities in the area, to be introduced to the traditional lifestyle of the indigenous people. After breakfast you will be drive to Bisoke, for a visit to the Karisoke Research Center, where Dian Fossey conducted her research on the Mountain Gorillas. Fossey was murdered by poachers and was buried at the Center next to her favorite Gorilla. Your guide will take you for lunch at a local restaurant near the Research Center; here you will get an opportunity to taste some Rwandese food. After lunch you will be driven to Kigali, and taken to your hotel for either a rest or a swim in the pool. Your guide will also inform you of other activities you could do while in Kigali City, and is available to take you around. After breakfast you will be picked up at your hotel and given a further tour of Kigali and its environs. Kigali has many interesting sites to explore, including the Holocaust Memorial center, which was constructed after the war. There are local markets with Rwandese handicrafts and local produce to adventure into, and your guide will introduce you to as many of these places as time permits. Your guide will introduce you to a Rwandese lunch at a local restaurant; tasting local foods can be very interesting for visitors. Afterwards, you will either continue with your tour of the city, or go directly to the airport, depending on what time your outbound flight is scheduled for..If it is an evening flight, you are most welcome to go for a swim at one of the local hotels in town; your guide is available and will make all these options known to you.